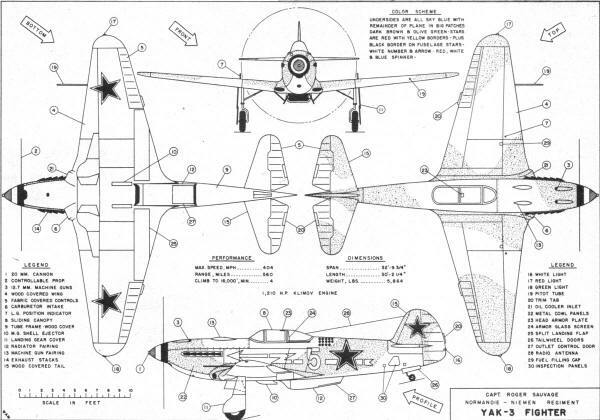 This article with plans and a 4-view of the YAK-3 fighter appeared in the Sept/Oct 1965 edition of American Modeler. Produced in greater quantity than any other YAK design during World War II this YAK-3 was one of the most successful Russian fighter planes. 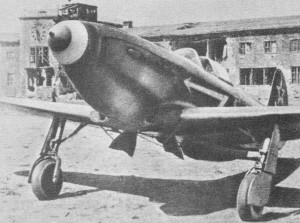 It was developed from the earlier YAK-1 of 1939 for which Alexander Sergeivich Yakovlev won a prize of 100,000 rubles (and an elegant automobile) in a Soviet design competition. The craft was a simple, lightweight, fast-climbing fighter with high performance at low altitudes where it was intended to maintain aerial superiority directly over the battlefield. These photos show the YAK-3 which was flown by World War Two Ace Roger Sauvage on the Russian Front. 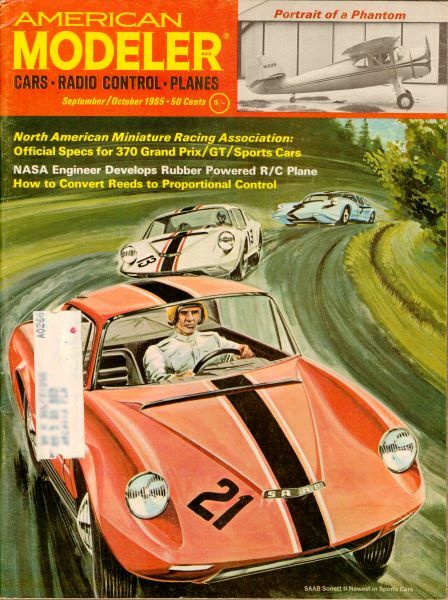 Note tricolor spinner and lightning arrow. 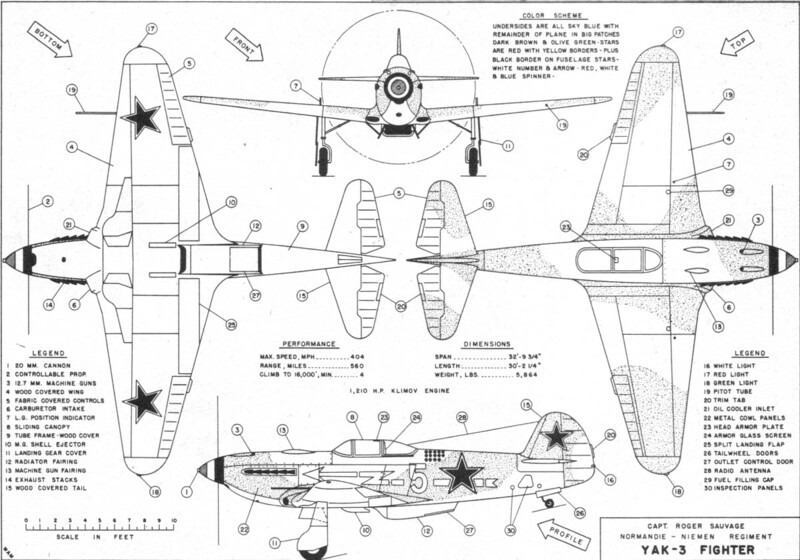 The YAK-3 had a loaded weight of only 5864-lbs which is less than half of some of the American and British fighters of that period. It could climb to 16,000-ft in four minutes and had a range of 560 miles at 193-mph. 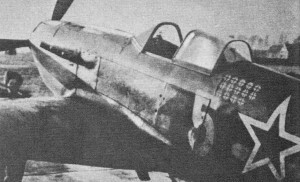 The Klimov M-105 PA twelve cylinder, liquid cooled, 1210-hp engine was fitted with a 20-mm cannon which fired through the propeller shaft. Two 12.7-mm machine guns were installed in the cowling with cocking levers extending into the cockpit. Top speed was 404 miles per hour and the craft is said to have compared favorably with the British Spitfire. Among the famous fighter units on the Eastern Front which flew the YAK-3 was the Normandie-Niemen Regiment. This group of Free French volunteers composed of four Escadrilles which arrived in Russia late in 1942 from North Africa proved very successful and destroyed 273 German aircraft in two years of action. Yet the Normandie-Niemen Regiment never consisted of more than about forty pilots. One of the leading Aces of this group was Capitaine Roger Sauvage who scored sixteen official victories on two fronts and received some of the highest French and Soviet awards for bravery and valor. The markings on this control line model duplicate those used by Sauvage on his YAK-3 fighter plane. The story of Roger Sauvage and the Normandie-Niemen Regiment will be featured in the October 1965 Air Progress. 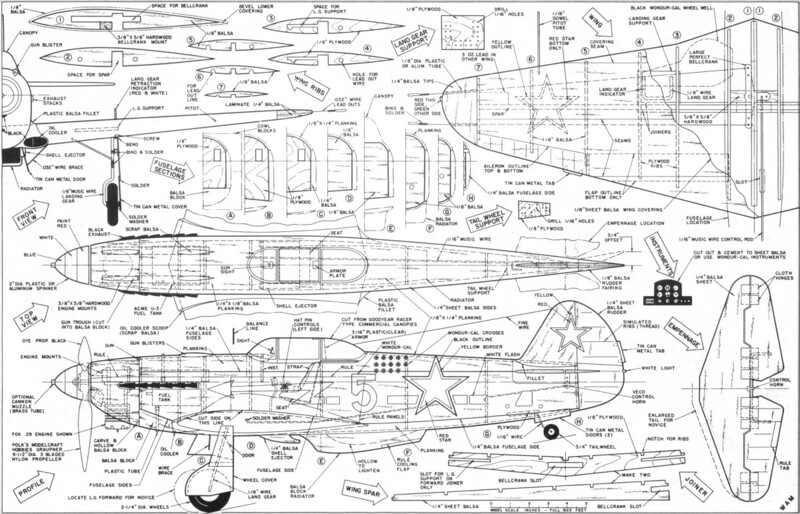 Our model of Sauvage's YAK-3, scaled one inch to one foot size, can accommodate any engine from .19 to .35 cubic inch displacement. Construction has been kept as simple as possible and is quite strong without excessive weight. When you have the full size plans begin construction with the wing. Trace the spar halves and joiners onto the prescribed wood and cut to shape. Cement the spars between the joiners, using plenty of the adhesive, and hold together with small "C" clamps until dry. Meanwhile, trace and cut all ribs to shape plus the landing gear supports. Construction instructions appear on Hobby Helpers Plan #965.